Up until about the 1960s, it was commonplace for big city newspapers to have 'aviation reporters' to keep the public abreast on the latest developments in aviation technology and air travel. At some point the 'wow' factor kind of disappeared, budgets were cut, and now most of the reporting is done by people who can barely spell 'airplane,' much less know anything about them. 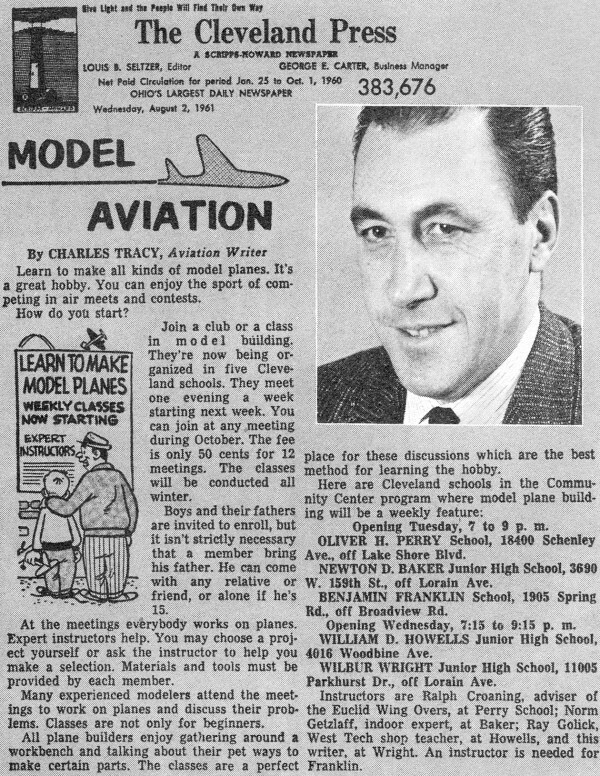 This 1962 edition of Model Aviation features a column by The Cleveland Press columnist Charles Tracy that extolls the virtues of model aviation in the area. The next month had a story on my town of Erie, Pennsylvania's, Morning News' reporting on control line clubs in the area. 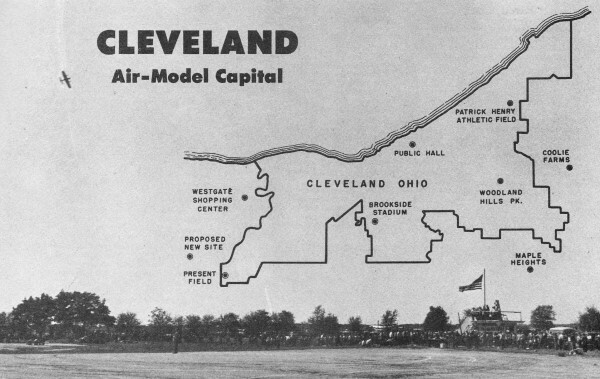 Location of model flying sites in and around Cleveland, Ohio. You've heard about the power of the press? The Cleveland Press, largest daily in Ohio, is undoubtedly responsible for Cleveland's claim to the title, "Model Aviation Capital of America." Not only does The Press publish a thrice-weekly "Model Aviation" column written by Charles Tracy, its full-scale aviation editor, but, through Mr. Tracy, looks for flying sites and sponsors, conducts contests, even helps direct training programs for juniors. There are about 15 air-model clubs in the Cleveland area and the interests of their members include all types of modeling - control-line, free flight, indoor and R/C. "Chuck" Tracy is the untiring champion of them all. For over 20 years, he has devoted much of his own time to the promotion of modeling. His enthusiastic supporters have been the Cleveland Recreation Department, headed by John Nagy, various aviation industries located in Cleveland, model clubs and numerous air-minded individuals and businesses. With Tracy constantly priming modeling interests, Cleveland's airplane hobbyists have one of the few complete programs in the nation. Results of all this were dramatized by records of the 1961 Nationals at Willow Grove. Underscored Tracy in a subsequent column, "More winners came from The Cleveland Press circulation area than from any state in the Union...48 prize winners...constituting 10.3 per cent of the total 491 winners finishing first through fifth." Larry Miller won the senior championship and helped his club, the Lakewood Flite-Masters, to snag the team championship; Dan O'Malley, was runner-up for the junior championship; Gary Cipra took the A.Y.S.C. beauty event. Other high pointers who helped to make this record included: Carl Wolenski, Dan Tracy, Tom Kopriva, Larry Loucka, Ron Roharik, Chester Lanzo, Tony Kuester, Don Sopka, Frank Rebec, William Werwage, Donald Sprenger, Rudy Kluiber and William Schubert. 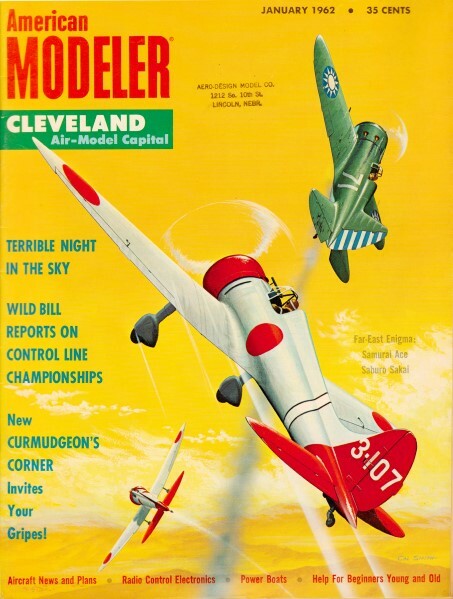 Cleveland's modeling story begins in the early 1930's when the city was host to the yearly National Air Races. Many of the large department stores borrowed models for their advertising displays and The Press, which is a Scripps-Howard newspaper, sponsored several promotions with model kits as prizes. 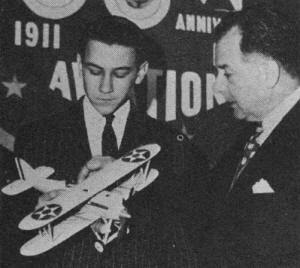 It was in 1936 that young Tracy was employed by Scripps-Howard to write about model airplanes. His air-model column holds a unique spot both in journalism and modeldom: it is the only such regularly scheduled in any daily newspaper. Model Aviation has a permanent spot on the comic and feature page of The Press. Through his column, Chuck has acted as the coordinator of modeling activities, the director of publicity, the organizer of contests, the seeker of flying sites, the reviewer of new aviation books and products and the instructor of modeling techniques. Once a member of the American Wakefield team (1937), Tracy's chief pleasure now is sparking a new generation of modelers. 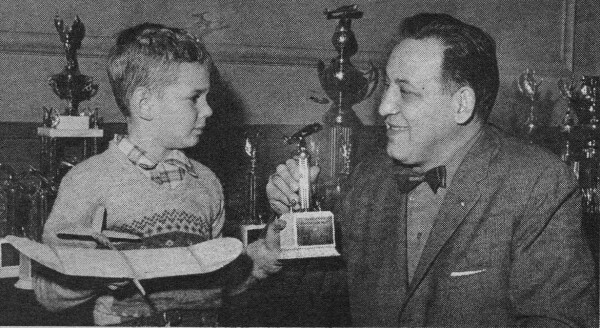 John Nagy, Recreation Commissioner for the City of Cleveland, awards prize to youthful model builder Kurt Reich, 7 1/2 years old. Gaffney family works on models at wintertime class sponsored by Board of Education. Among winners of Paul K. Guillow awards: James Gaffney (2nd from left); Paul Gaffney (center). Some of the model clubs, such as the American Airlines Gas Model Club and the Cleveland Society of Model Aeronautics date back to the late 1930's. Others like the Lakewood Flite-Masters, Cleveland Airfoilers and Thunderbirds M.A.C. had their beginnings in the 1950's. This expanding model interest in Cleveland has led to more and more contests. Some of these are sponsored by The Press and other cooperating businesses, some by the model clubs themselves and some by the hobby dealers. Oldest of these meets still running is the Junior Air Races, now going into its 27th year. This annual event is conducted by The Press, the Cleveland Recreation Department, two business firms and several aviation-oriented groups. In 1961, it featured 41 control-line, free flight and R/C events in four classes with 123 prizes. At all contests in which The Press participates, there is no entry fee charged the contestants, but all fliers of power models are required to have A.M.A. licenses. All this competition activity has, of necessity, made The Press and leaders realize that modelers must have places to practice and to fly for fun, as well as to stage contests. Tracy, the Cleveland Recreation Department, and other modeling devotees have been responsible for the development of several flying sites. One of the first was established at Woodhill Park in the southeast part of the city, a second a bit farther south, off Turney Road and a third early model port was on the west side. All these gave way, in time, to development projects. The most recent control-line center was at Cleveland-Hopkins Airport. Tracy and Nagy jointly selected the site. Along with others interested in helping the fliers of model aircraft, they pushed for its approval and improvement. This site was dedicated in 1952. Nine years later the Cleveland-Hopkins Model Airport, with five flying circles and a control tower, was lost because of the lengthening of adjacent airport runways to handle jet service. Nagy and Tracy had the immediate problem of locating a spot for the Junior Air Races coming up in mid-July! They found the answer in the huge expanses of asphalt parking area at the Westgate Shopping Center, one of the largest in Ohio. The directors of the center were consulted. When the need was explained to them, they offered the use of their space, free of charge. Meanwhile, a likely spot for a new model port had been found northeast of the old one at Hopkins Airport. The Press and the Recreation Department approached the city fathers about buying the plot. The City Planning Commission approved, but the land purchase must await city council action. At present, the council is swamped with the details of a multi-million dollar redevelopment program, Erieview, to rebuild the core of the city. However, it is expected that the new site will receive favorable attention as soon as Erieview pressures let up a bit. But, this isn't the only site plan that Cleveland's modeling boosters have up their sleeves. Allen Vopal of the Custom Model Aircraft Co., during a visit to the county airport, received a site offer from Bob Shae, airport manager. Mr. Shae stated, "When we put our new runway in, perhaps we can get the contractor to clear off enough extra space for five circles." Vopal mentioned this to a friend, a big name in Cleveland industry, the friend responded, "Let me know if this goes through and I will get you the Cyclone fence to put around the field." Also, another idea for the future, which would benefit especially the junior modelers, is being considered by recreation leaders: six small one or two-circle sites scattered about the city. If the Recreation Department could set aside these areas and maintain them like they do baseball diamonds, Tracy feels that the modelers would keep them more than busy with practice and sport flying. For major contests, he believes that the shopping centers could be counted on for use of their parking lots. Some Cleveland clubs have located areas for their own use, either with the help of local officials or the owners of suitable fields. In Maple Heights, a southeast Cleveland suburb, the Cleveland Airfoilers have had the assistance of Mrs. Paul Gray, their director of recreation, in getting a flying field. The R/C modelers also have been lucky. The Cleveland Recreation Department obtained a flying site for them on Cooley Farms, a city-owned tract at the eastern edge of Cleveland. All this points up the fact that good places to fly are a prerequisite to any successful, large-scale model aviation program. The facets of this program are many. The efforts of the model clubs, the Recreation Department, The Press, the schools and other organizations and individuals make it possible for any boy or girl to build airplanes and to compete in some of the many Cleveland contests. Initial emphasis for these youths, of course, is toward instruction. During the summer months, the Cleveland Board of Education has included basic modeling classes at 204 playgrounds. The instructors of these playground projects are usually college students who get a pre-season model building briefing from Tracy. The participating youngsters furnish their own materials and work on their models, mostly gliders and stick jobs, in preparation for the big annual Flying Circus, sponsored by The Press, the Recreation Council and several business firms. George Seedhouse, assistant director of physical welfare, is the leader. To ensure the maximum winning motivation, the Circus awards include 36 first places and 36 second places with four age groups - do-dos, 9 and under; ban-tams, 10 and 11; fledglings, 12 and 13; juniors, 14 and 15. Charles Tracy, aviation editor of "The Cleveland Press" with one of his "Model Aviation" columns. Tracy has boosted this event for the past seven years. The 36 top winners receive an American Airlines cruise over Cleveland, 36 runners-up get a handful of tickets entitling them to a free day on everything at Euclid Beach Park. The Circus is staged at three sites, the Patrick Henry Athletic Field, Woodland Hills Park and Brookside Stadium. It is estimated that about 2,000 youngsters enter the finals and another 2,000 participate at the playground level. The next step for a boy who succeeds in the playground program is participation in one of the October-through-April model building classes for fathers and sons, held at four high schools. This also operates through the Cleveland Board of Education with George Seedhouse in charge. The instructors? Tracy and three assistants. The classes meet one evening each week and the participants bring their own building supplies. The projects on which they work depend upon the skill level of the student. It is required that all the boys be accompanied by one parent to each class period. The only charge is 50 cents for each course of 12 classes, or $1 per season. In 1961 about 80 father-son teams participated. By the time the boy has finished these classes, sometimes even before, he is likely to begin thinking of club membership and contesting. Five high schools in the area have aviation clubs. Young modelers of Cuyahoga county, in their senior year of high school, can apply for the $500 college scholarship in aeronautical engineering given annually by the Cleveland Women's Chapter of the National Aeronautic Association. The 1961 winner was Andrew Hutyera of John Marshall High School. (1) Great Lakes Indoor Air Meet, held at Public Hall each January under the sponsorship of The Press, Recreation Department and others. This, said to be the nation's largest indoor meet, usually draws 400 to 500 contestants to compete for 90 beautiful trophies in six age groups. The ceiling at Public Hall is 90 feet, floor area is 120x240 feet. (2) National Model Plane Show, held annually in March under the sponsorship of the Air Foundation and the Cleveland Chamber of Commerce, with the assistance of Tracy. There are 25 events with 16 special trophies and 100 prizes. This is a static display contest with extra points allowed models with "proof-of-flight" records. The age divisions are by school grades - 3 and 4, 5 and 6, 7 and 8, 9 and 10, 11 and 12, and 18 years and over. (3) All-Scholastic Aircraft Show, held in April at the St. Edward High School, is open to all modelers in Northern Ohio high schools, has competition in static display and indoor flying scale with four age divisions (freshmen, sophomores, juniors and seniors). The 24 top winners are flown to Washington, D.C., to see the aviation exhibits at the Smithsonian Institution through the courtesy of various airlines and other businesses. Other sponsors include The Press and the aviation club at the host school, the St. Edward High School Golden Eagles Aviation Club. (4) World Championship Free Flight Eliminations, conducted by the Cleveland Society of Model Aeronautics, held in May with events for Nordic A-2 gliders, Wakefield rubber and F.A.I. power models. The entry fee for all modelers 17 and under entering this meet is paid by the C.S.M.A. This club also has designed and printed full-size plans of a Wakefield model called the "Challenger" which they distribute free of charge. In addition, C.S.M.A. members take part in an inter-city meet with various other clubs in the Great Lakes area who are interested in F.A.I. events. (5) Armed Forces Day Air Show, held in May under the sponsorship of the recreation department, The Press and three Cleveland business firms. This is a control-line meet featuring events in three classes (junior, senior, open) for stunt, flying scale, Navy carrier and proto speed. There also is a sports race for boys 15 and younger only. All prizes at this show are gift certificates ($10, $7 and $5) for first three places. (6 and 7) The Junior Air Races are held in July; the Flying Circus is held in August. (8) Armory Indoor Meet, held in November, sponsored by The Press, the Recreation Department and other businesses, has four age classes. The job of securing processers, timers and judges for the meets in which The Press participates as well as contacting various businesses for awards is assumed by Chuck. Some of the financial load of these contests, such as the $500 daily rental for Public Hall, twice yearly, is assumed by the Recreation Department. The Press underwrites many of the expenses, budgeting in the neighborhood of $5,000 yearly for these purposes. 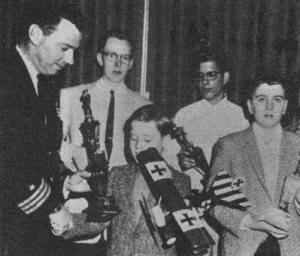 Even with the extensive contest schedule in Cleveland many clubs find time to give exhibition flights and put up displays. 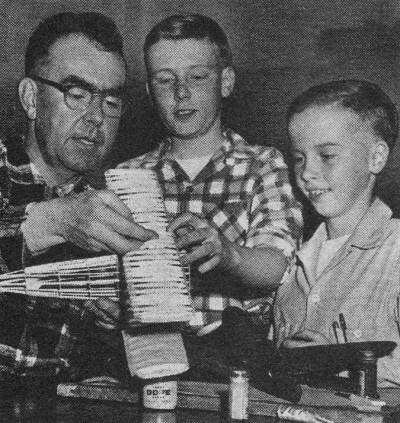 The Flite-Masters have performed for children's homes, hospitals, Boy Scouts and at county fairs. The Thunderbirds and American Airlines Gas Model Club annually put on demonstrations between one of the double-header ball games of the Cleveland Indians. Other clubs show their flying techniques at schools, dedications, etc. Yes, Cleveland's modeling record is indeed unique, because newspapers like The Cleveland Press and newsmen like Charles Tracy are scarce. Not often do you encounter such hard working recreation leaders as John Nagy and George Seedhouse! All these good folk plus dedicated organizers who are willing to leave their own models unbuilt, unfixed or unflown to devote their time to boosting modeling in all its phases are hard to come by. If you are lucky enough to have one or more of these rare "birdmen" in your community, give them your help. What has been accomplished in Cleveland could be duplicated elsewhere.